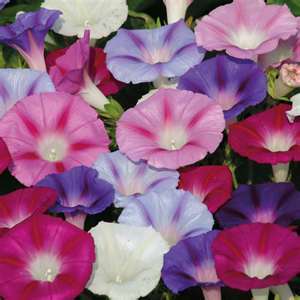 The morning glory is a beautiful flower, mostly known for its trumpet-like shape and the way it unfolds. It opens up in the earlier parts of the day, creating a canopy of color for those having a number of them planted near one another. 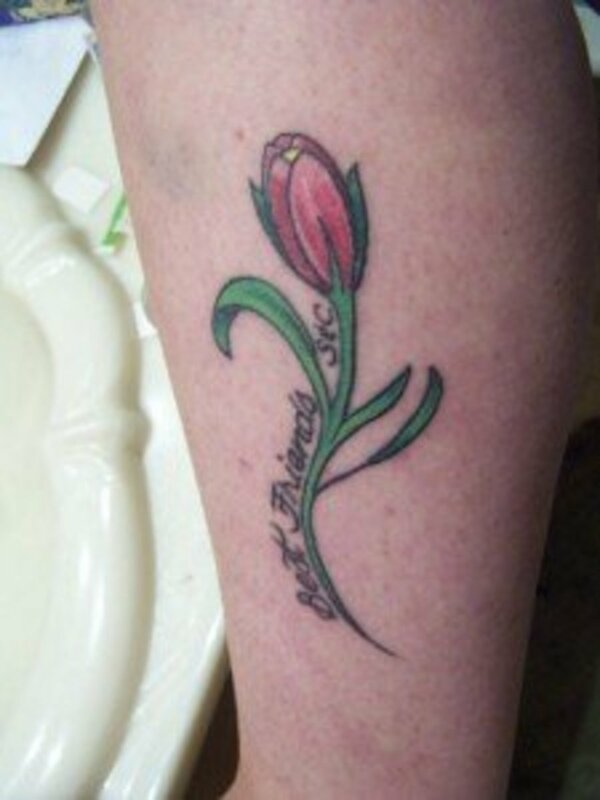 This combination of color and shape make it a desirable choice for those loving flowers and looking for tattoo ideas. Another exciting aspect of the morning glory flower is the way it attracts hummingbirds, which love to poke into the flower and drink its nectar. 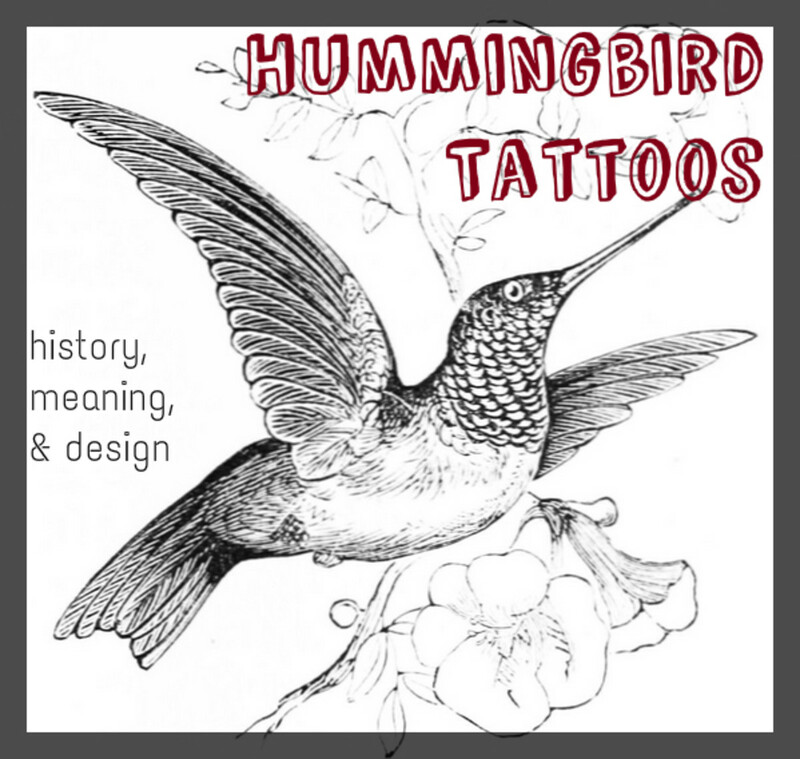 That of course also lends itself to great tattoo design ideas for flowers and hummingbirds. Morning glories, with over 1,000 species, have many colors. The most popular and well-known are purple and blue. Those choosing the morning glory as a tattoo design will almost always have one of those two colors as their choice for the body art. As mentioned above, morning glories come in a wide range of colors, as seen above. 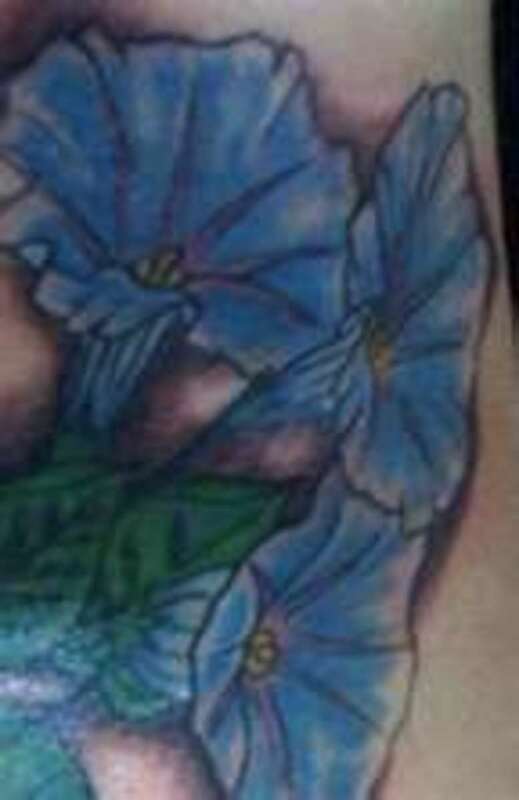 These were also included for those of you whom may never have seen a real morning glory, so you can get an idea what they look like and compare them with the morning glory tattoo gallery below. Look closely underneath the flowers to see the trumpet-like stem leading up to the bloom. 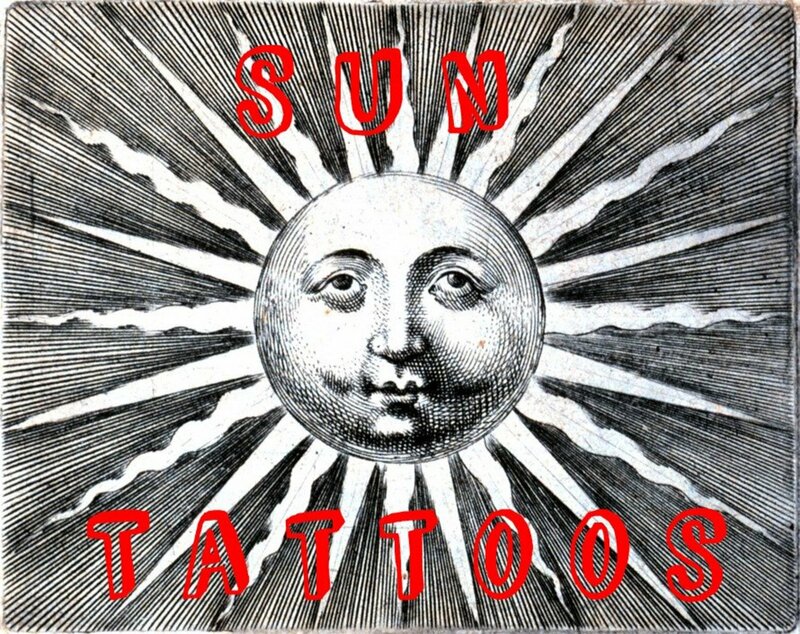 We'll start the tattoo gallery off with a look at three blue morning glories done in a traditional and realistic design. They include nice detail and capture the flower very well. Notice how the shadowy lines within compare with the real morning glories above. If realistic is what you prefer, this is a good sample of what they would look like. 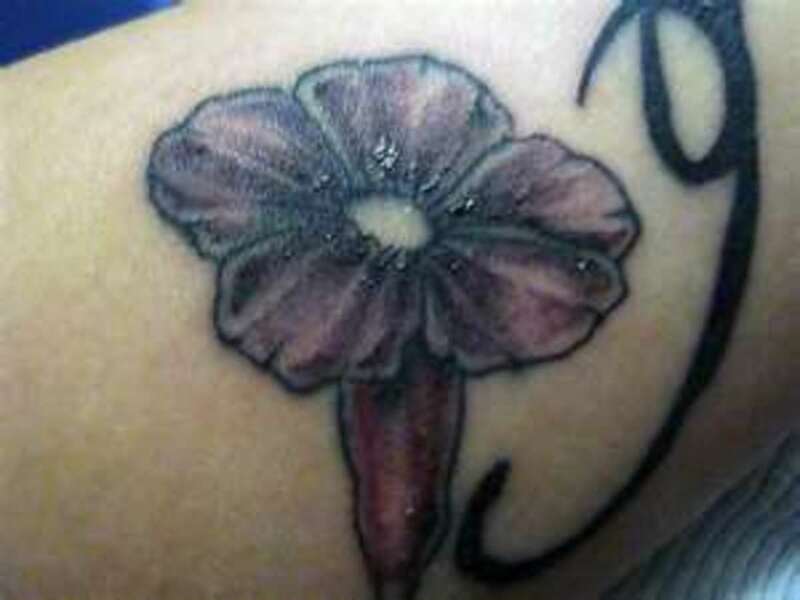 Next we have the other most popular of the morning glory tattoo colors: purple. Again, the choice is one of having a design that is close to how a morning glory really looks. The purple is pretty nice, although real purple morning glories have a much different and more vibrant look than the purple color chosen here. That scroll on the right is almost certainly part of a tribal look for the stem, which would be wrapped around the arm, ending where you see it in the photo. 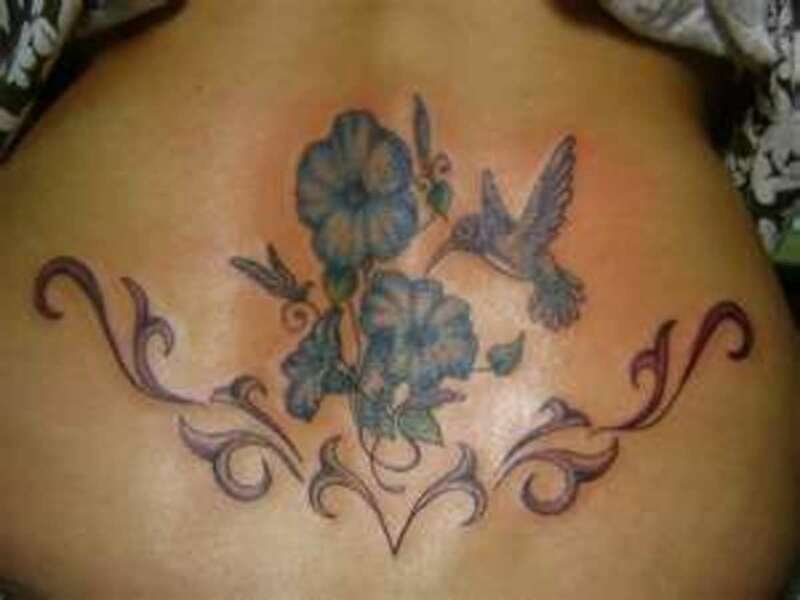 Here we have a couple of morning glories representing the colors purple and blue, showing how they look as a back piece. If you're wondering what that odd-shaped thing is sticking out between the two flowers, it's what a morning glory looks like before it unfolds in the morning. My favorite part of this tattoo design is the vining stem up the woman's back. Everything works off from there, as it does with the real life plants. 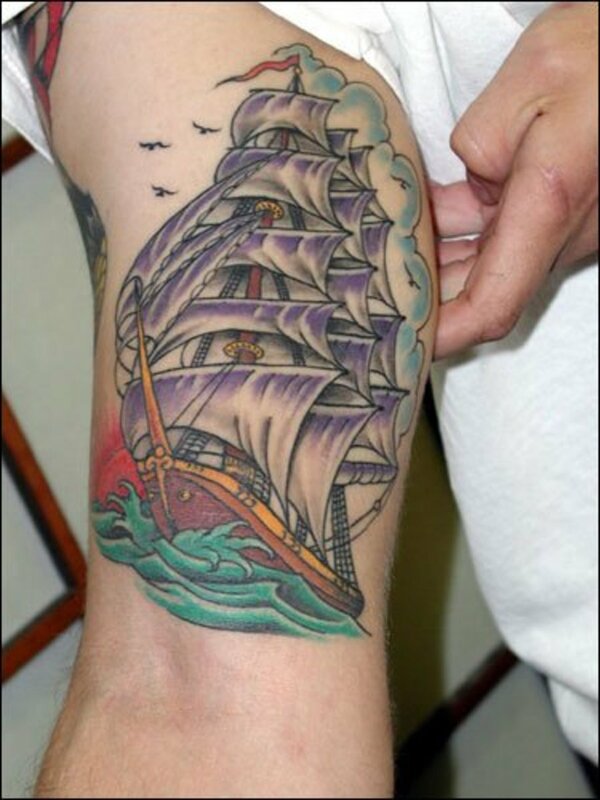 I like just about everything with this tattoo. The position of the hummingbird is great and realistic, as I've seen this happen numerous times around morning glories I've grown, and it captures the moment just before the hummingbird is about to dip its head quickly and repeatedly into the morning glory. The vines with the other morning glories, as well as those curled up getting ready to unfold, really are done well. Finishing it off is the tribal effect at the bottom of the work, which seems to represent the vining part of the plant. 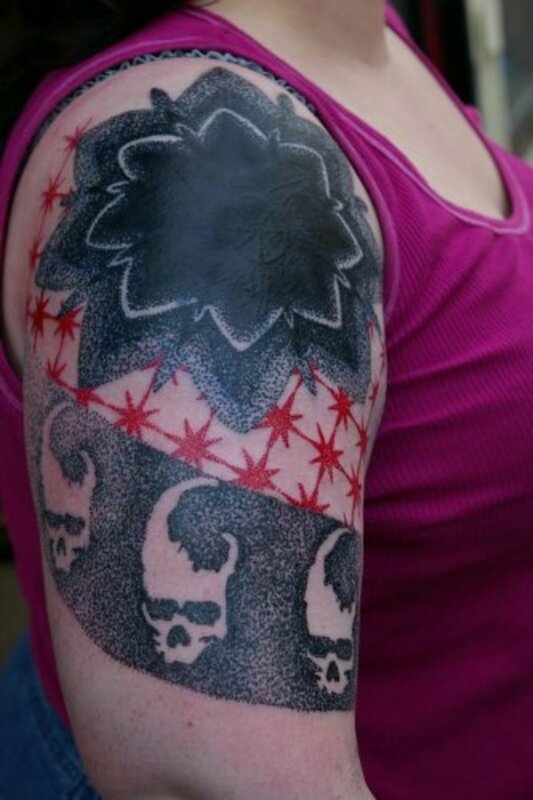 Overall this is a very solid tattoo design, especially if you're looking for something with a little size to it. 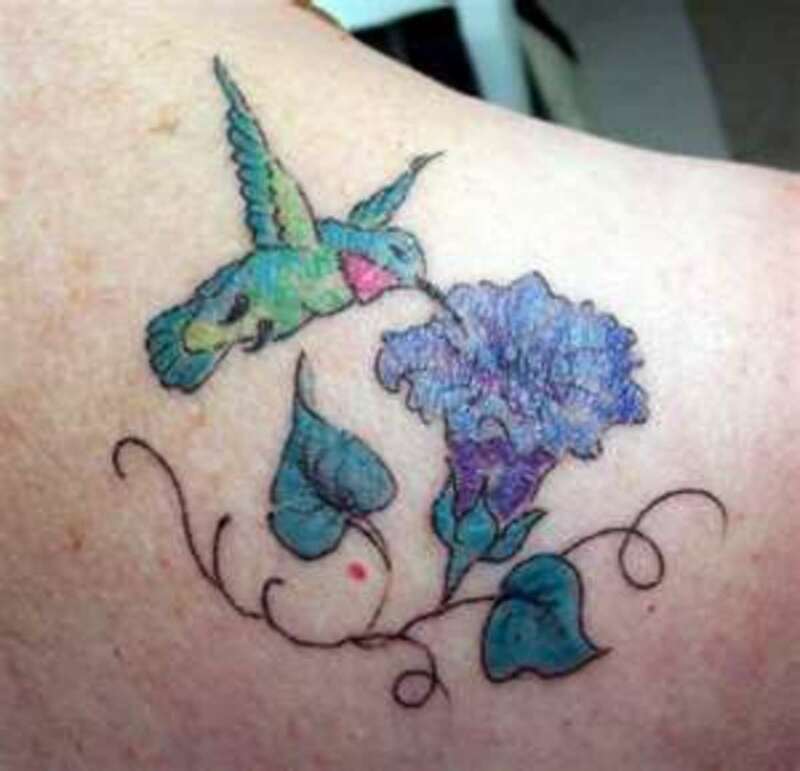 Although this isn't to the quality of the above hummingbird and morning glory tattoo, it's a decent one. A couple of problems are the color of the leaves, which don't blend well with the color of the flower. That clashes because the blue color of the flower has a realistic appearance while the off-color of the leaves doesn't. The hummingbird also fails, mostly because of the placement of the feet of the bird, which are off center with the body, making them look like they're growing out from the side of the bird. 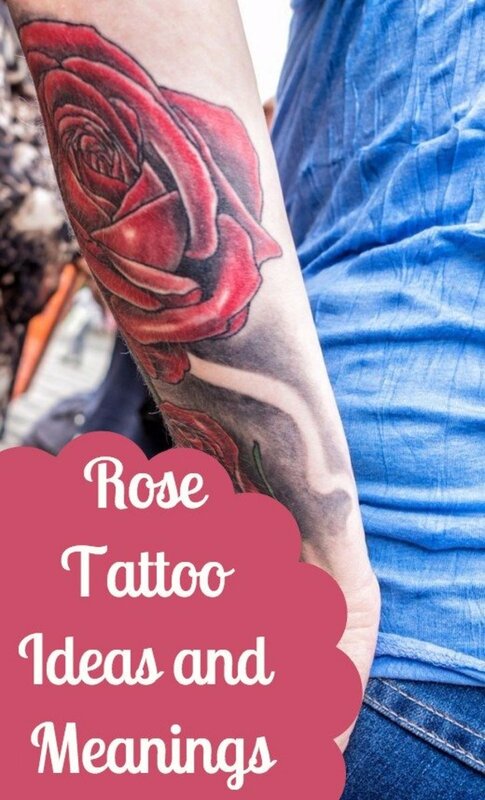 I mention this because if you're going to get an image permanently placed on your body, you need to be sure it looks great and is what you want. This one doesn't work from that point of view. I thought this was a cute morning glory design, as it doesn't attempt to be of the highest quality, but was made to look cute on the foot. It accomplishes that very well. To me, a foot tattoo should be more fun and playful, and shouldn't, in most situations, attempt to be serious art. Foot tattoos are meant to put a smile the face of the one looking at it, and, as mentioned, look cute. Imagine a tattoo on your foot and people bend over a couple of feet from it staring at it and wanting you to turn it side to side to get a glimpse of the great work. Not a lot of fun for most people. 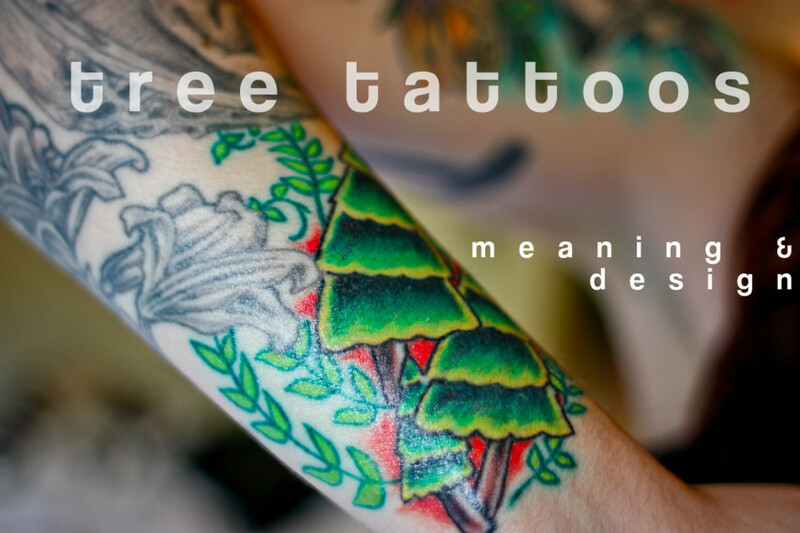 A tattoo meant to be whimsical and fun is just as compelling as one that is a serious design, based upon it accomplishing what it was meant to. 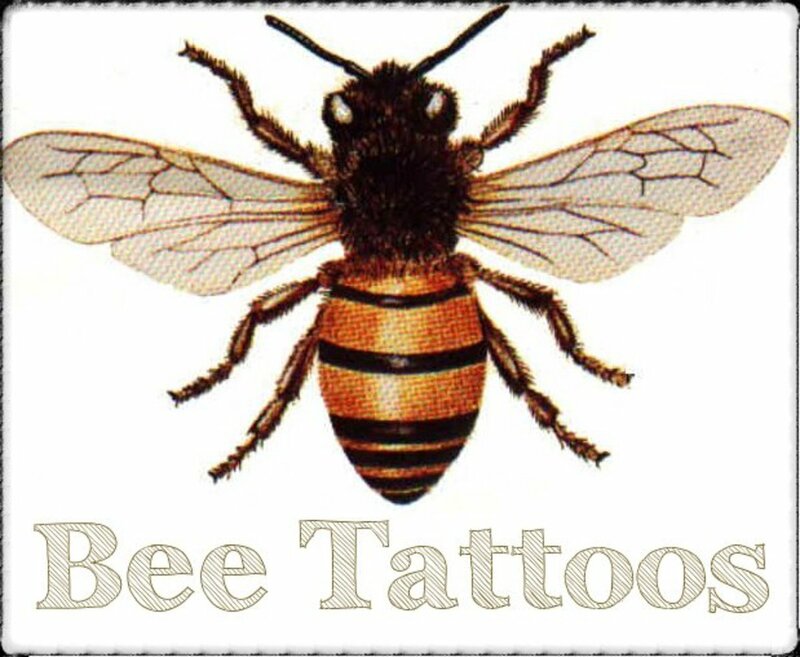 That's why I'm more positive with this one than the weak hummingbird tattoo, which was a serious attempt, but failed pretty badly. 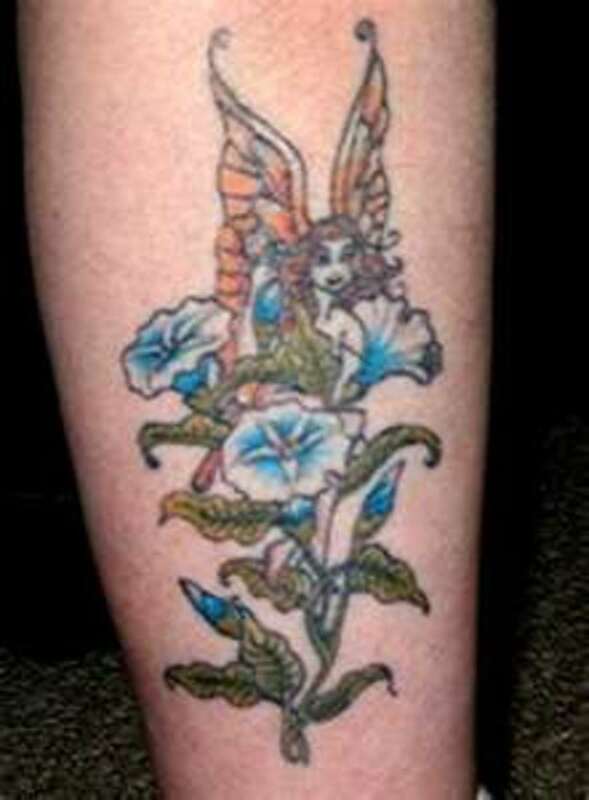 Fairies are among one of my favorite mythical characters, and they translate well to tattoo designs, as you can see here. This one is being playful among the morning glories. It has a smile and mischievous look on her face. All of that is great, but I really like these morning glory blooms as well. They look fantastic, and the choice of a multi-color bloom was a good one, especially since they were designed very nicely. If you're wondering what that odd blue color is on what seems to be leaves, remember the way morning glories look before they unfold. The blue color is part of the folded morning glory as it looks before opening up for the day. So while they look odd because they are blue in color, it is in fact an accurate portrayal of the plant. For me, sometimes simplicity is the best, and that's how I view the real morning glory flower, and by extension, the morning glory tattoo designs shown here. The simple, uncomplicated look of the flower lends itself to great designs and scenarios which engender fantasy and reality, which are sometimes blended together to create whole new worlds. You could easily lose that with the more complex flowers and scenarios you find out there. 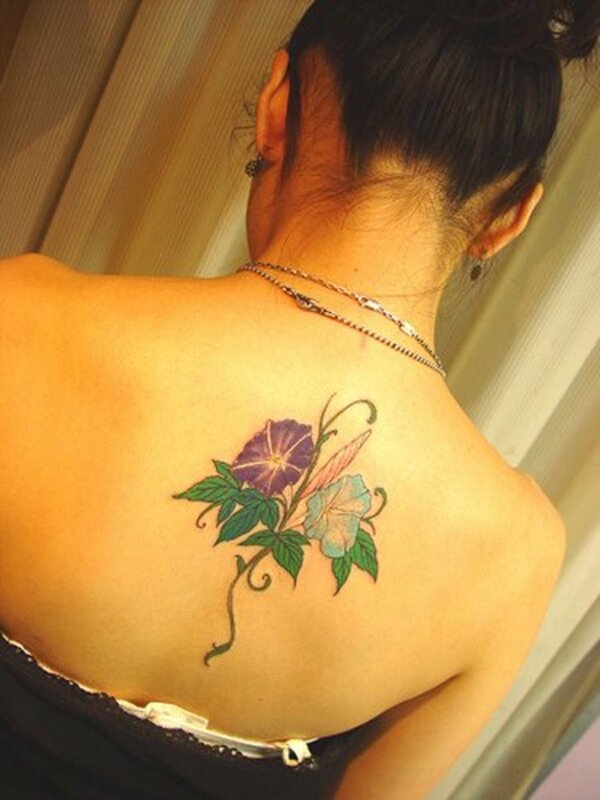 With that in mind, the morning glory is a very inspirational source of material for those seeking a compelling and fantastic flower tattoo, and one that can be adapted to a lot of circumstances to get the look and feel you want. What more can you ask for in a tattoo?